Winter was the most beautiful and the most awful time to stand guard on Hadrian’s Wall. As I looked out across dawn-lit hillsides sparkling with frost, the forests in the distance and the smoke rising from barbarian villages, the pale stillness had a grandeur as stark as my mood. I could enjoy it for less than an hour before ice gnawed at the tips of my toes, two layers of socks not enough beneath open toed sandals. My armour carried the bitter cold through layers of wool to my chest. I would be sorry to leave these sites behind, but not the sensations. I missed the warmth of home. Unsteady footsteps and the bump of a shield hitting stone steps told me Tullius had been drinking before his shift. We all coped how we could, and the centurion turned a blind eye to more than he had before Albus’s death. Everyone had loved Albus, with his smiles and his endless laughter. I grunted in return. I hadn’t the heart for Tullius’s banter. “It’s nothing,” I said. Sharing my decision would only make it harder to follow through. “No drinking on duty.” I resisted the urge to grab the amphora and fling it over the wall, to break something for the sake of breaking something. “There’s nothing to talk about,” I said. I wanted to close my eyes. This would be easier if I couldn’t see him. But whenever I closed my eyes I saw the decimation. One man in ten from our unit beaten to death by the rest because we had retreated in battle. Albus’s skull giving way beneath my blows. He downed the contents of his amphora and flung it away. It shattered in the courtyard below, but there was no-one outdoors to see it. Tullius reached out to pat my shoulder. I shook him off. “Then they send us out here.” Now that I’d started, the words wouldn’t stop pouring out of me. “I grew up in Palestine. This place is beautiful – the trees, the clouds, the rain. But the cold is killing me. I can’t think, I can’t sleep, and when I lie awake all I see is Albus. Tullius froze, looking around to see if his raised voice had attracted attention. But nothing short of a full assault was bringing anyone out of the barracks in a British winter. A chill gripped me. Icy tendrils pierced my heart more deeply than winter ever could. “I didn’t think-” I started. “No, you didn’t,” Tullius said. He sighed. Then he flung his arms around me. I could feel the warmth of his cheek against mine and smell cheap red wine on his breath. He took a step back. As I stared at him in shock he looked all around. Freedom stretched out before me along the dirt road south. An image flashed into my mind. A face giving way beneath a club. This time it was Tullius, not Albus. I looked out across frost-shrouded hills. There was no beauty there any more, just a numbing cold. Decimation was a real disciplinary practice in the army of ancient Rome. If a unit was found guilty of cowardice in battle then they would draw lots. One man in ten was beaten to death. Their comrades had to do the killing. I’ve been thinking about decimation more than usual recently. I’m reading Adrian Goldsworthy’s The Complete Roman Army, and then I saw a particularly harrowing and convincing portrayal of decimation in an episode of Spartacus. I was struck by just how psychologically harrowing the punishment must have been for some of the survivors, alongside the terrible brutality of the deaths. And so I explored that in the best way I know how – a story. If you’d like to read a less harrowing and more exciting take on ancient Roman then try my historical fantasy novella Ocean Gods, Roman Blades. And if you’d like to receive short stories like this straight to your inbox every Friday then please sign up for my mailing list – you’ll even get a free e-book. * When did decimation become a practice? * were some officers tragic abusers of it? * were other officers opposed to the use? From what I’ve read – which is overviews of the Roman military rather than research on this specific topic – decimation was a feature of the Roman military from early in its development, certainly from the days of the Republic. I’ve never read anything that indicated it got abused, and it was such an extreme step that I’d be surprised if anyone did. The men to be killed were chosen by lot, so it wasn’t like a commander could use it to whittle away troops he didn’t like or considered sub-standard. As for other officers opposing it, I don’t know. 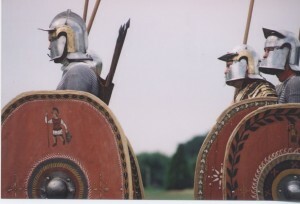 There was a social gap between the officers and the legionaries – in general, senior officers came from the senatorial class (roughly speaking , the aristocracy), junior officers from the equestrian class (something like the medieval knightly or modern upper middle class), and the ordinary troops from the other citizens. I suspect that those divisions, together with a general preference for strong discipline, kept humane concerns out of the mix, but I could be wrong.